How big is too big? No such thing when you're talking about computer monitors. 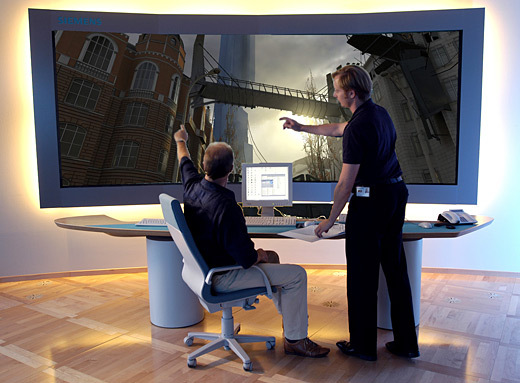 Siemens lashed together eight LCDs, making this gigantic display about which precious little information is available. All we know is, we want one. Here's Jason's take on it. Because Jason was too stupid to realize Charlie already covered this, and wrote it up anyway. Used only for monitoring nuclear power plants and a prop for my weekend "Learn to Point" learning annex class, this Seimens LCD is the craziest monitor this side of Leibermann's photoshop files. 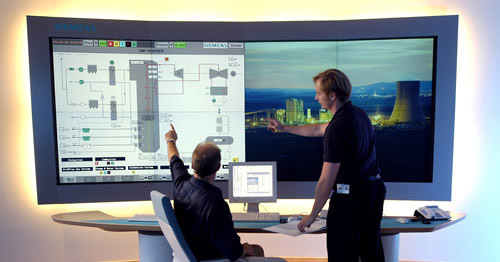 Actually made out of eight separate, Voltron-esque LCDs, this monitor is undoubtedly out of everyone save for the richest Bond villains. But just imagine playing Gears of War on this baby. Duck and roll baby. Duck and roll!